The Scientific Breakthrough That Will Change How the World Learns! So that you may have a better comprehension of how this powerful paradigm shift will forever change the way you look at learning, and so that you can more effectively use this site, we urge you to take a few moments to look at the select videos below and to read the copy under these videos. The Cracking the Learning Code web site is dedicated to helping individuals and organizations dramatically accelerate their speed, efficiency and joy of learning by understanding the science of learning. The information on the Cracking the Learning Code web site is the culmination of over 20 years of scientific research into how to accelerate the speed of learning and enhance its effectiveness. The key finding is that in each one of us there is a genetically implanted Learning Code™, which must be turned on before we can create long-term memory and behavioral change. Trying to effect long-term memory and behavioral change without accessing our biological Learning Code is like trying to open a bank vault with the wrong combination. It can’t happen. The reason why the information on this site is so important and controversial is that it has the potential to revolutionize the way you learn and forever transform the way learning systems are developed. The Learning Code has been missed until now because it cannot be uncovered by any single scientific discipline. The extreme specialization in science has generated all the information needed to reveal the code but without the means to assemble it. 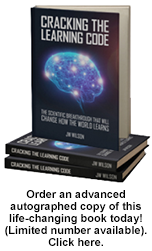 The man who uncovered the Learning Code, JW Wilson, has spent the past three decades conducting research into the fields of neuroscience, genetics, molecular biology, evolutionary biology, quantum physics, complexity science and chaos theory. The result is this web site and the soon-to-be-published book Cracking the Learning Code – a scientific detective story and a paradigm shift in understanding how we learn. When fully integrated and operational, the components of the Learning Code can facilitate astonishing advances in the speed of learning, the depth of understanding and the duration of retention. This is not a new “quick-study” gimmick or technique; it is our biological birthright, revealed like a picture in a jigsaw puzzle by fitting together thousands of pieces. Ignorant of the Learning Code, our corporate, government and academic learning systems have failed to deliver the high-speed learning that we are biologically wired to achieve and that our society so desperately demands. Worse still, trying to stimulate learning without switching on the code is not only painful but can actually reduce an individual’s future capacity to learn. The costs of employing learning systems that fail to turn on the Learning Code are severe. One educational expert estimates that over 90 percent of all adults are dissatisfied with their ability to learn and remember. Or reflect on this ugly little secret among corporate trainers: 12 weeks after the average corporate training session, most participants forget 85 percent of the information delivered. This means that of the $54 billion a year spent on corporate training, $46 billion will be wasted! In today’s “knowledge society,” information is doubling every 18 months; therefore, an individual’s learning speed and capacity have become his or her greatest assets. In this information-rich world we can no longer rely on unscientific learning systems designed 2,400 years ago in an agrarian age when information doubled every 1,000 years. We must turn to the cutting-edge scientific principles provided by the Learning Code. Cracking the Learning Code web site is designed for anyone frustrated by their children’s, their organization’s or their own speed of learning and behavioral change. There is no web site that addresses today’s learning crisis so comprehensively or proposes a solution of such scientific depth. Please understand that this groundbreaking information cannot be understood through sound bites. To facilitate a deep understanding of these revolutionary concepts, we have gone into a substantial level of depth. More on who this site is for. Thirty-two major elements make up the Learning Code, which are listed below and on the left in blue. Gaining an understanding of these elements will allow the user of this site to dramatically increase his or her learning ability. At the same time, comprehending these elements will clarify why traditional classroom learning systems that rely on stand-and-deliver linguistic presentation, memorization, and pen-and-paper tests have been so ineffective at creating long-term memory formation and behavioral change in the majority of the population. The site is set up like an onion, which allows the user to easily and quickly go to each Element, read the first few paragraphs to grasp the general concepts that make up that Element and then return again and again to peel back more and more layers, going deeper into the Elements that most interest you. Take your time; there is no hurry. At the end of each Element is a section that discusses topics to be covered in future newsletters and the book Cracking the Learning Code. It is suggested that you take the time to read these topics, not only to increase your present understanding of the Learning Code, but to set your brain up to “pre-learn” so that you can more easily assimilate this information when it is presented in greater depth. While the Elements of the Learning Code are laid out to be read in order, feel free to follow your interests and click on any of these Elements in any order you choose. We have only one strong recommendation: that you first read “What Is Learning?” “What Is Intelligence?” and “What Is the Learning Code?” so that you have a firm foundation from which to understand all the other elements of the Learning Code. Please understand that this site is not yet complete. More audio, visual and interactive elements will be added in future. Also, over the next several months, blogs, videos and web seminars as well as question-and-answer roundtables will be implemented. Please keep revisiting the site so that you receive the benefits of these updates. Also please be aware that this site is not meant to take the place of reading the book Cracking the Learning Code. 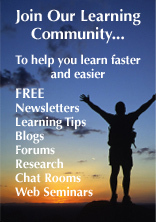 It is here to help you gain a fundamental understanding of the Learning Code. Those that want a deeper understanding and more in-depth solutions are referred to the book and asked to sign up for the free newsletter. Just click on the category above that most interests you.